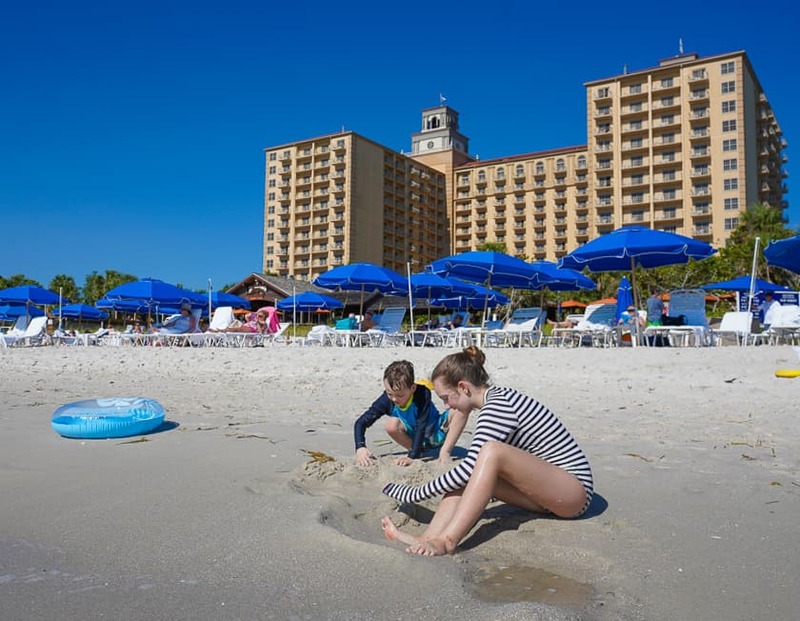 What are the best luxury Florida resorts for families? In Miami? Palm Beach? Naples? Orlando? 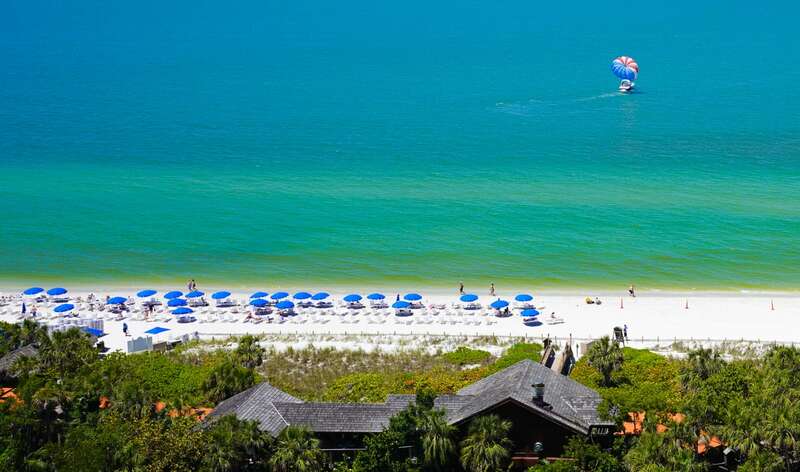 No vacation can recharge a family in winter faster than a quick Florida break. Flights are easy; many are direct. Budget airlines have brought airfares down across all carriers. With all of that money you save not flying to the Caribbean, you can assign those dollars to your resort. Here’s where to go if you are looking for the Sunshine State’s absolutely most luxurious, full-service resorts with kids’ clubs, stunning grounds and service, and poolside cocktails. If we’ve missed your favorite, share in the comments. Oceanfront views from the Ritz Carlton Naples. The Ritz-Carlton has such a stranglehold on Naples that there are two Ritz properties. 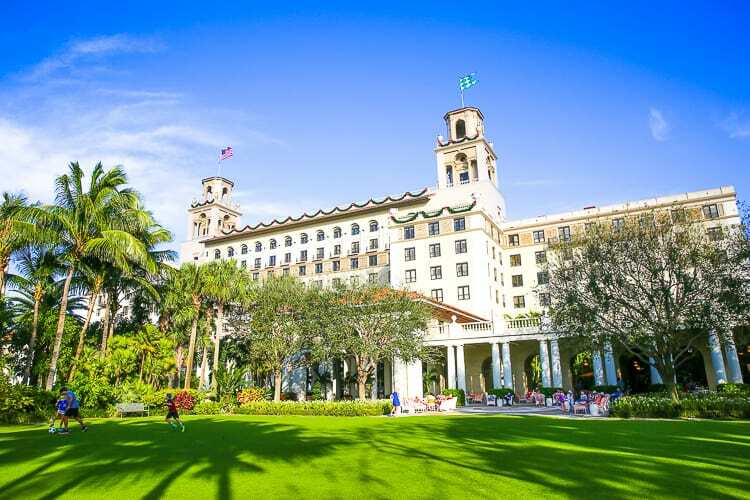 The Ritz Carlton Naples, is beachfront, and the Golf Resort is within a 10-minute drive. They’re both fabulous in their own way and incredibly family-friendly. Guests of both resorts have full access to all amenities offered. The resorts provide a luxury shuttle to go back-and-forth between the two on schedule. 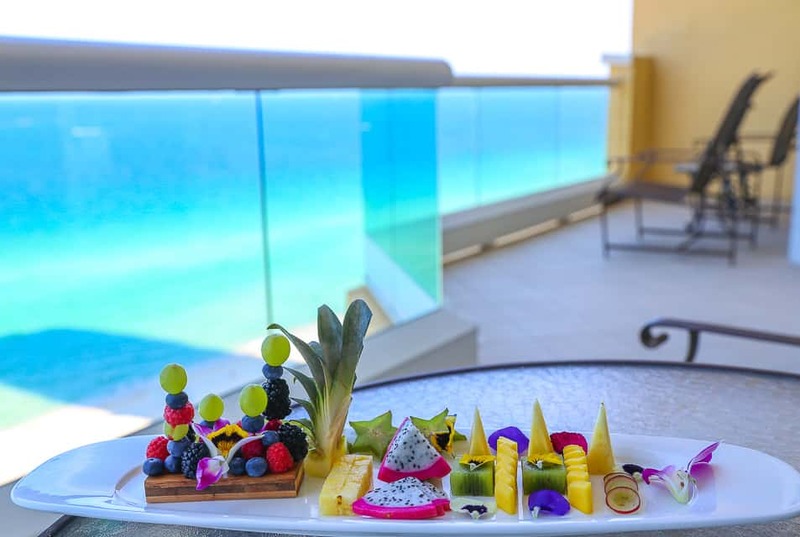 The most premium experience is a spectacular club-level room at the beach resort with sweeping Gulf of Mexico views of the jade green water. This property was— for years— the top-rated Ritz-Carlton property, and considered one of the best US resorts when it opened. The Ritz Carlton Naples is the beachfront on the Gulf of Mexico with legendary sunsets. While many resorts from the Ritz brand have been modernized and updated from its well-known southern country club decor, this property isn’t letting go of that aesthetic anytime soon. It suits the formal atmosphere the resort seeks the moment you enter the main lobby. These rooms at the Ritz Carlton Naples have two double beds. Families have many options to entertain themselves, starting a check-in with a sticker scavenger hunt. 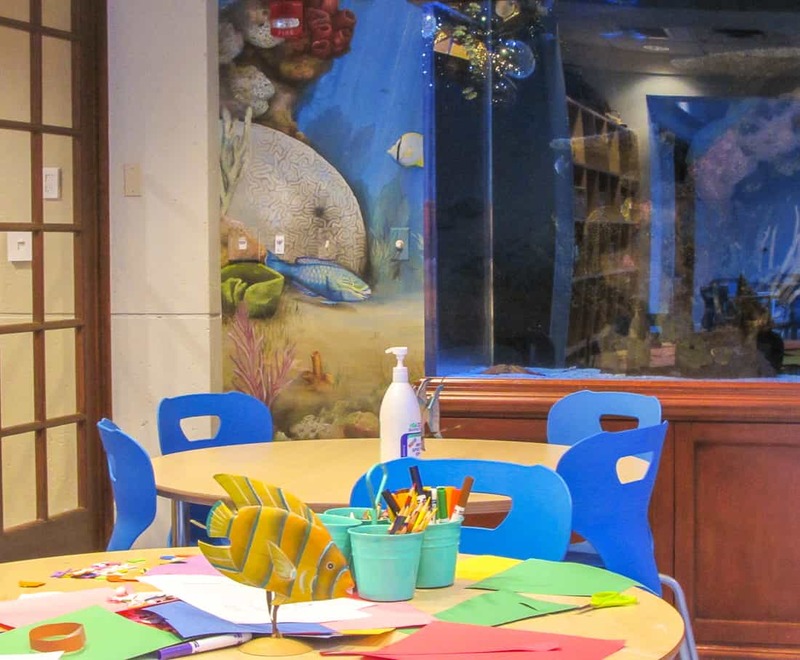 The marine life and animal collection at the kids’ club would rival a small city’s aquarium or natural history museum, and if that weren’t enough, guests can blow glass next to the pool on weekends for a unique souvenir. The pool at the Ritz Carlton Naples Golf resort gets quiet once pool service concludes each evening. The true ritual at the Ritz Carlton Naples beach resort is sunset and most resort guests and others from the area gather at the beachfront Gumbo Limbo restaurant for a sunset ceremony and tropical cocktails. The Ritz Carlton Golf Resort, by contrast, has a quieter pool scene and a smaller number of rooms. 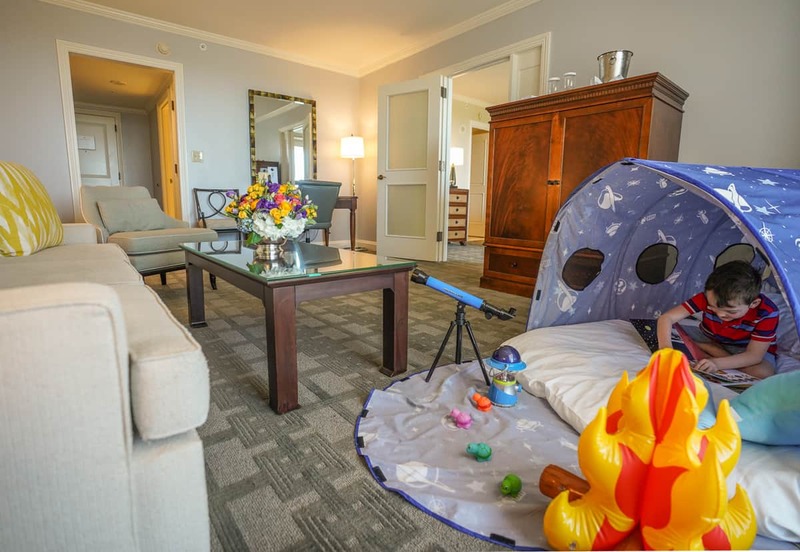 Families can book expansive club level suites at the golf resort and request an in-room camping setup for your young stargazer. In in-room camping experience at the Ritz Carlton Naples Golf resort. Turtle watch provided separately. The golf club at the resort is exceptional; my son was thrilled with his golf lesson and the dedicated pro teaching the kids’ program. There are tennis courts at both properties. When it’s time to get cleaned up after a day of sunshine, even the most formal of this luxury resort’s restaurants manage being family-friendly exceptionally well, particularly with their children’s menus. Our most formal meal at the Grill was our favorite, as my kids loved the attentive service with multiple servings of housemade pretzel bread. Finishing their first chocolate soufflé was a joyful fifteen seconds. Families of four at either the beach or golf resort who do not reserve a suite or adjoining rooms will be stuck with two double beds. Families with one child can book a king room and have the chaise made up as a twin. Club level rooms have access to generous spreads that could replace all breakfasts, some lunches, and even some dinners. For ages 5 to 12, half and full-day programs are available; a gaming lounge for teens; and a resort scavenger hunt at check in. The Golf resort has a creative playspace filled with a massive blue foam block system that will encourage fort building for at least and hour. A video game room and mini movie theatre are next door. Check rates at the Ritz Carlton Naples or the Ritz Carlton Naples Golf Resort, or read our reviews on both Ritz Carltons. The Hyatt Coconut Point isn’t beachfront. It’s all about their wonderful pools and waterslides. This resort north of Naples always delivers and surprises first time guests. 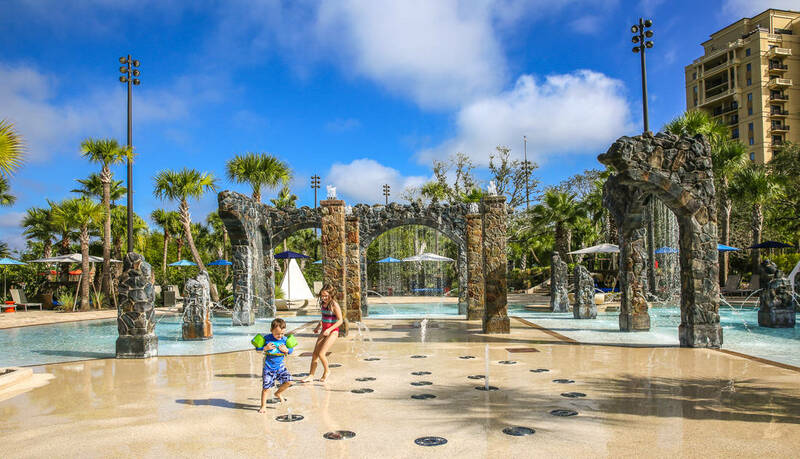 Though basically a Florida convention resort, families started really flocking here in bigger numbers when the pool area expanded to add a small water park pool area. The atmosphere is tropical and cheery and a good bet for families who seek a really well-run, but casual, resort. 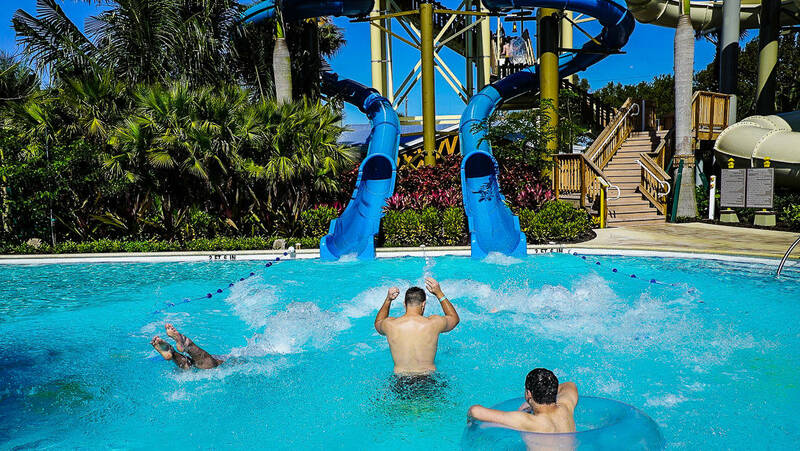 The expansion of the pool and water park areas now include five water slides and a lazy river. 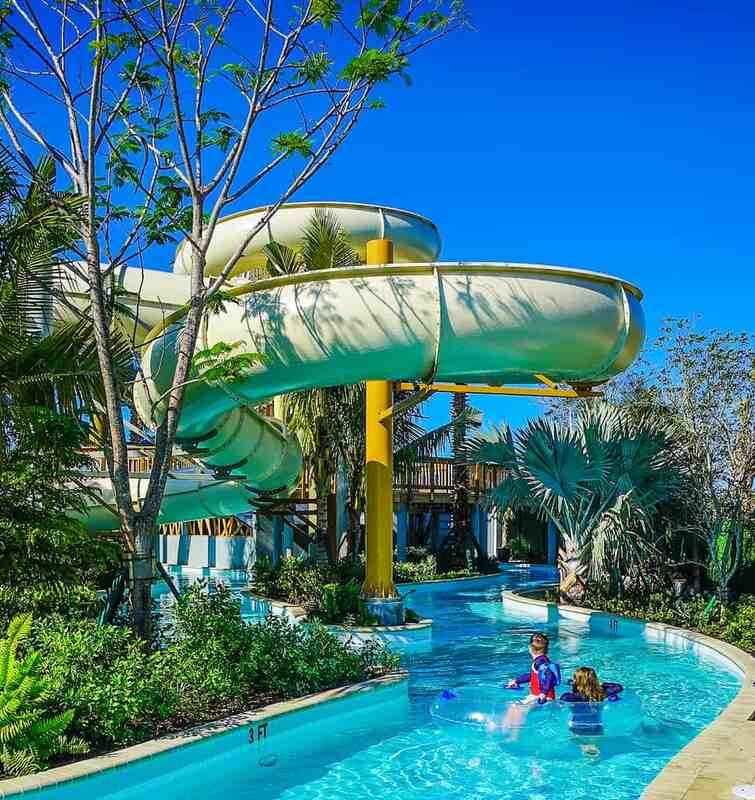 Two speed slides encourage races at the Hyatt Coconut Point. The rider on the left wins with pointed toes. There are two adjacent slides for racing and a slide for duos to enjoy using inner tubes that’s great for families. There are two other traditional slides scaled for bigger and little kids, too. The lazy river is very serene. We spent hours in it one day, making friends with other guests and enjoying leisurely chats. Everyone seemed to be as blissed-out as we were. Grandparents guided infants in floats passed out in sweet naps, and, for me, it felt like a family yoga retreat by day’s end. 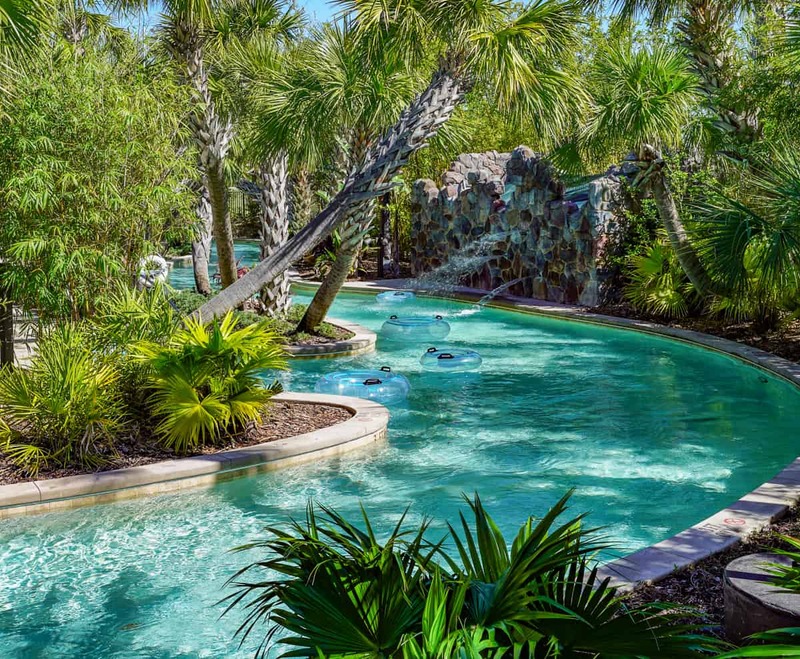 This lazy river is one of our favorites. 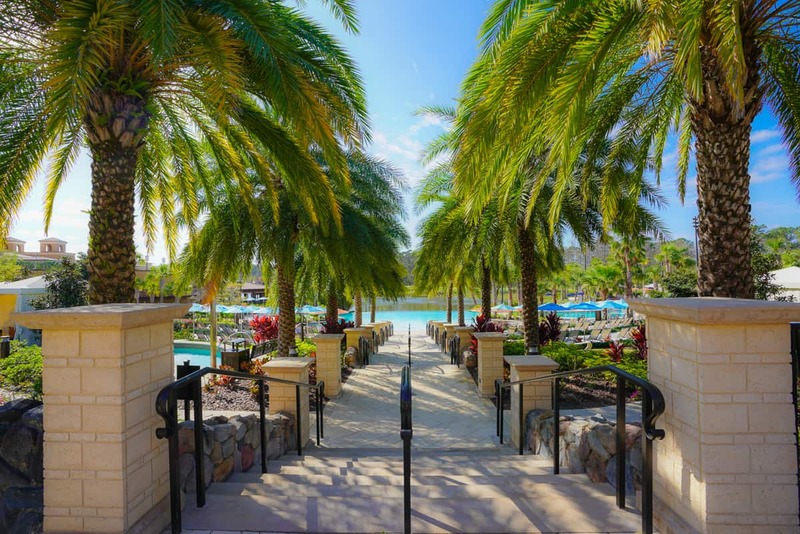 The Hyatt Regency Coconut Point is not directly on a beach, as guests must take a trolley ride or walk the quarter mile to a marina; from there, guests take a boat to a private island for some sand castle building or water sports. Dolphins and other wildlife frequently make their presence known during the journey but — with a pool area as fantastic as theirs— we never had the time to partake in such an adventure. There’s also a mountain climbing wall and a daily schedule of poolside actives for families and kids. 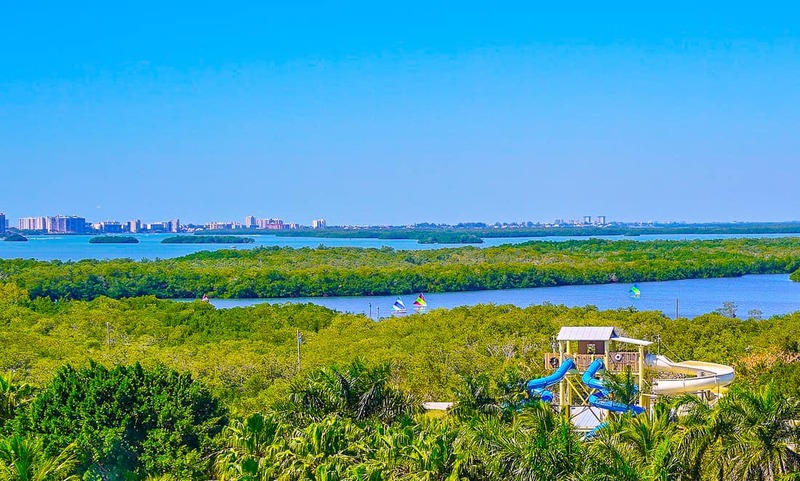 The resort is a good launch pad for more eco-adventures in the area to see the marine life or take boating adventures. Tarpon Bay is an enjoyable seafood restaurant for a date night or family dinner, but otherwise, the resort is built for casual poolside meals, room service, or food from a takeaway market. Families who do not book suites (all of which have pullout sofa beds) may find booking two adjoining rooms the most comfortable. Standard rooms come with one king-sized or two queen-sized beds. There are club level rooms, too. Families will enjoy breakfast, but, as with most Hyatt lounges, lunch and dinner offering won’t be as kid-friendly. There is a kids’ club offering half, full-day, and evening sessions. Kids must be aged 3 through 12. The morning session from 9AM to 1PM includes lunch and costs $65 per child. Afternoon sessions are $55 per child from 1pm to 4PM, and evening sessions— on Fridays and Saturdays only— run $65 from 6PM to 10PM and include dinner. Children might make crafts, watch movies, visit the arcade next door, or families can on their own. My children were the only campers in the session and the counselor customized their time to their preferences. Check for rates, or read more about our stay at the Hyatt Regency Coconut Point. The Breakers has a historical lineage few Florida resorts do. 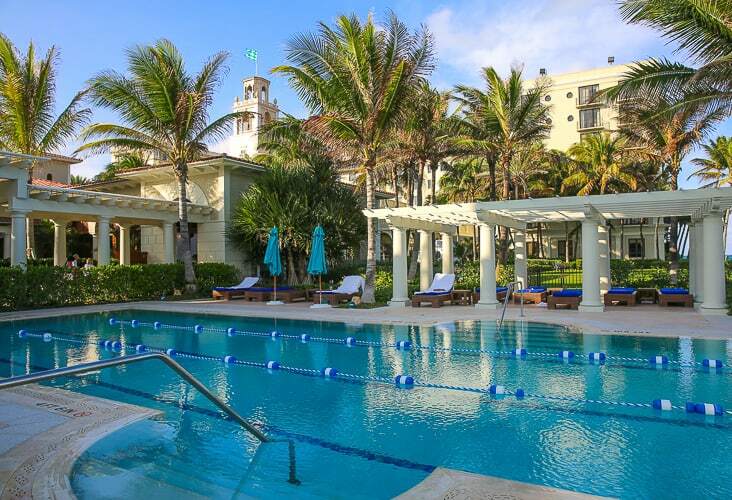 The Breakers is truly the iconic Florida beach resort that offers a luxurious family break in Palm Beach. Hotel lovers can’t help but show their respects when entering the lobby of this Gilded Age masterpiece Henry Flagler built while extending the railroads down to Miami. The Breakers has remained privately owned and is proud to offer a capital reinvestment program to ensure that the resort is consistently evolving to offer its guests a top-of-the-line experience. Considering its credentials as a historic resort, The Breakers commitment to change is impressive. The adult-only pool at The Breakers allows for laps and quiet lounging. It’s newer spa building, for example, is exceptional for parents looking for a little bit of time away from kids. It’s the only spa I have ever been to that offered gelato in hidden freezers next to healthy trail mixes and fruits. 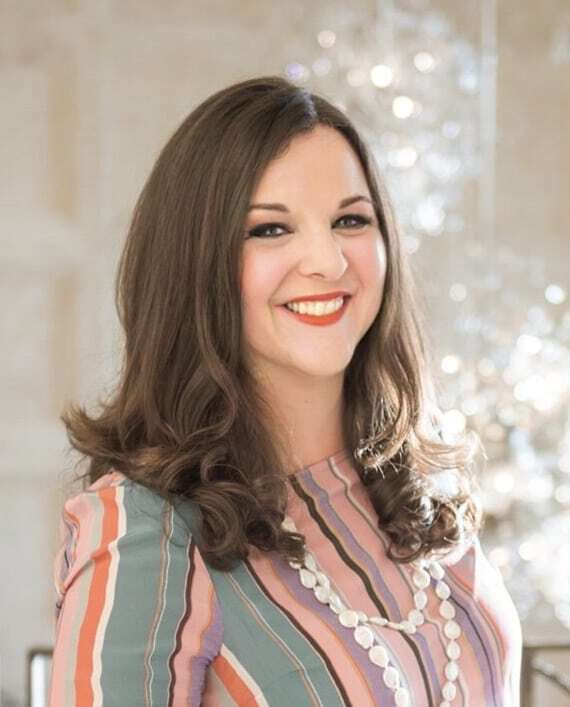 All guests receiving facial treatments receive a complimentary free make up application at the Guerlain boutique next door. 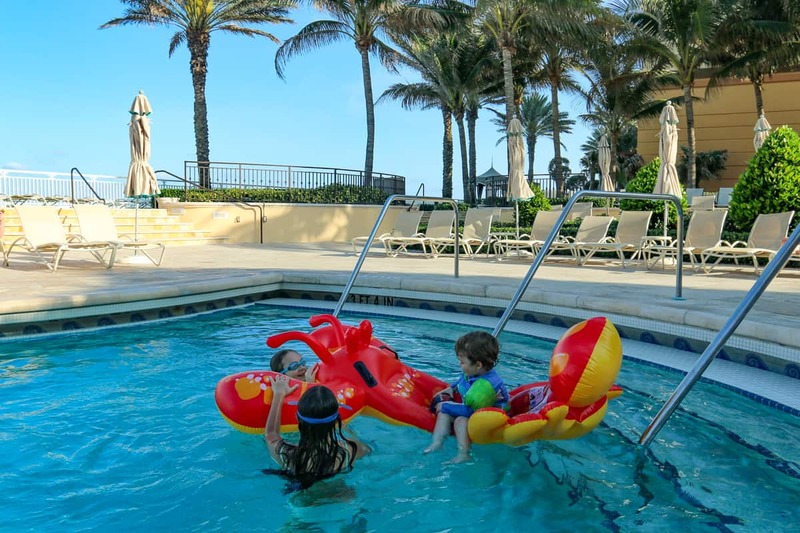 Despite the visual splendor of the Breakers, the resort embraces families in every aspect. Looking at the vintage frescoed ceilings in the main lobby, I laughed at seeing a stray Mylar balloon that escaped from a child’s hands. Pristine manicured lawns transform into multi-generational frisbee or soccer games. Children push their scooters down the colonnades connecting the pools and recreation facilities. The Breakers offers numerous on-site dining options, as well as a few nearby offsite restaurants accessed by a resort driver. A family could switch between Italian, sushi, steak, and seafood for a different type of dinner every night without ever leaving the resort or needing a credit card. Staffers adorned in Lilly Pulitzer dresses coordinate with each poolside role. Note the Beach Club restaurant by the pool is open to resort guests and club members only. The Breakers kids’ club is in the same building as an arcade, playground, and an Italian restaurant with a playroom. The Italian restaurant is worth mentioning in terms of how family-friendly it is for those who have young children between the ages of two and eight. 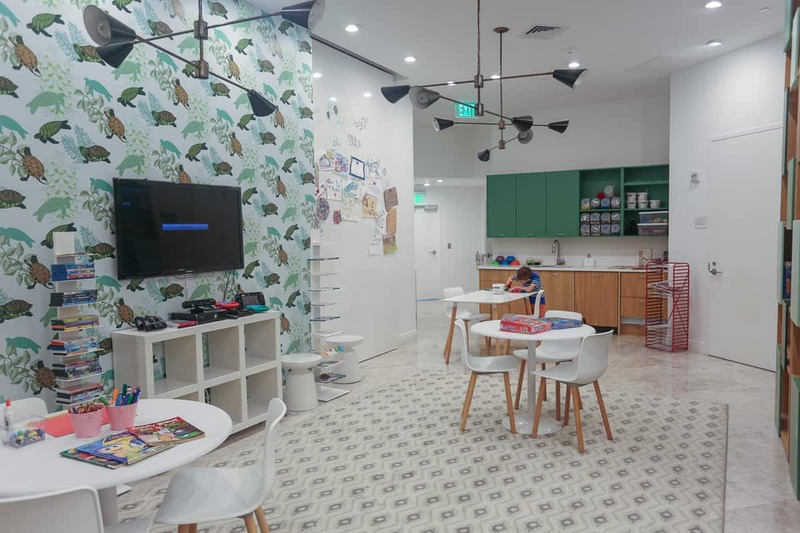 There is a clever playroom encased with a glass wall facing the restaurant; parents can watch their children build with blocks and play a few games from their seats while they enjoy a glass of wine before the meal arrives. This restaurant is adjacent to The Breakers lovely playground as well as their arcade and children’s club. There is an adult pool, as well as a few other family pools with zero entry and cabanas flanking the sides. The private beach area is smaller than those at Miami resorts, as the sand covers much less distance from the waves. Families have the option of booking suites and junior suites with sofa beds or adjoining rooms. 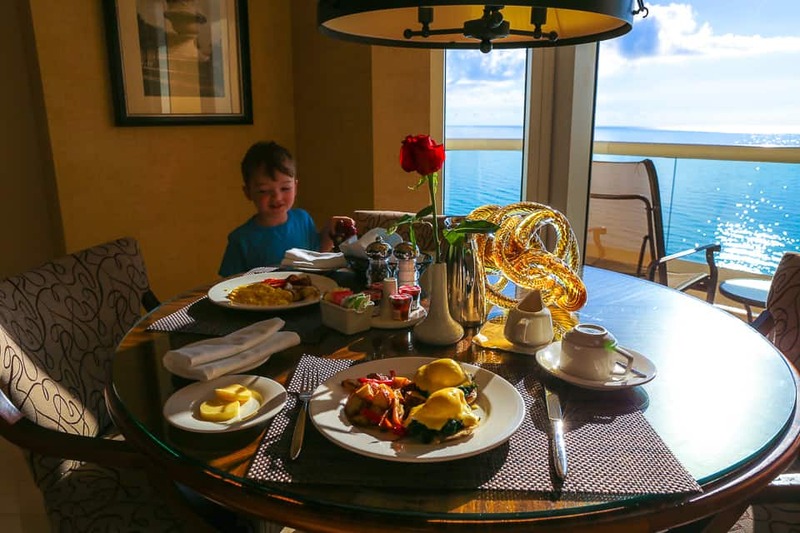 There is a huge range of accommodations at The Breakers, and I suggest confirming with the property directly that you have chosen a room that offers the bed configuration your family needs. The Flagler Club is a club level experience for only 25 rooms designed for couples or those traveling for business, but not families. A junior suite with two double beds and a sofa bed at The Breakers. There is a kids’ club for 3 to 12-year-old children. A day session runs from 9AM to 3PM with lunch provided and an evening session runs from 5:30 to 9:30PM. Tennis and golf clinics available for children, too. There’s a fabulous children’s resort wear boutique on site to buy more vacation outfits. Kids will enjoy the playground and arcade at all hours. Check rates or read our full review of The Breakers. The Eau’s rooms are infectiously happy. In an area steeped in its own traditions, The Eau likes to poke fun at the Old Palm Beach by going for chic irreverence. 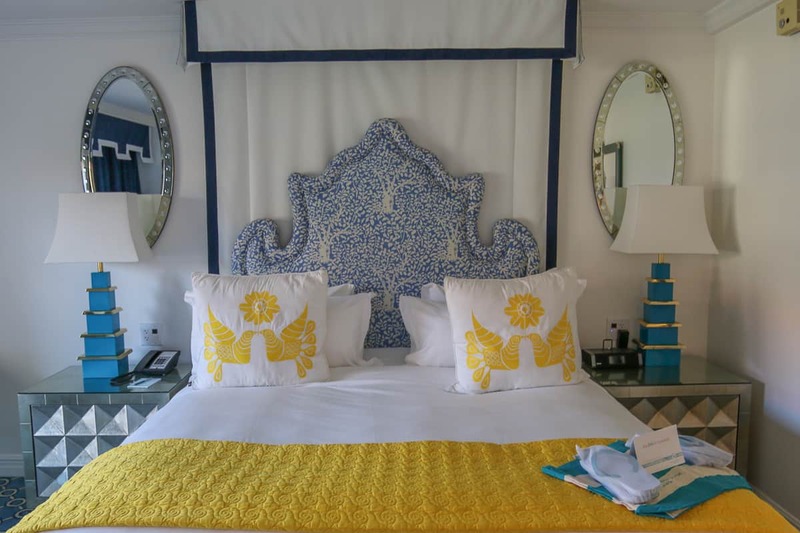 The Jonathan Adler colorful design of the property’s rooms and spaces defines the resort’s experience. The exterior architecture of the property doesn’t tease what’s in store for guests once they step inside this one-of-a-kind property south of Palm Beach’s central action in Manalapan. The pirate playground at the Eau. Rooms are decorated with unique touches and amenities, and hotel lovers will appreciate every design detail and amenity. The homage to Palm Beach’s love for chinoiserie style with Pagoda lamps and blue bathroom cabinetry. The navy drapes and needle point Palm Beach pillows provide a finishing touch. Balconies offer white birdcage porch swings to enjoy ocean views. Dining poolside with ocean views at the Eau. 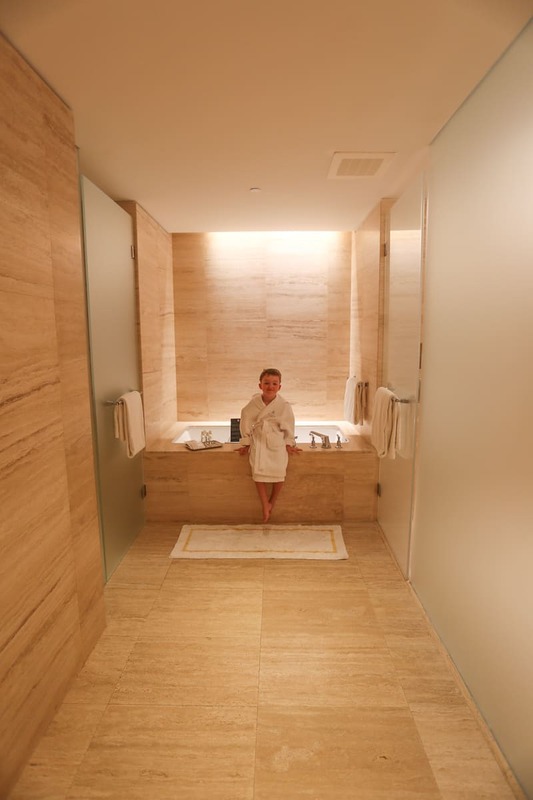 The Eau, known for its exceptional spa, boasts a really impressive kids’ club, as well. Kids find it after enjoying a pirate ship playground nearby. Once inside, different rooms within this very large space revolve around specific themes. Children can practice being a DJ, mountain climb a chalkboard wall, play dress up costumes, dance. Dining at the resort can be casual by sticking with the oceanfront and poolside restaurant. Breakfast is an elegant buffet with creative items mixed with the traditional. The resort served the best chocolate chip cookies the size my my children’s head. Though the pools are straightforward, the resort leaves large floats in one of them for children to share throughout their splashing time. By learning to take turns using it, they make friends and play together. Making friends at the Eau while sharing pool floats. My children were happy enough, and then a pool server brought a tray of frozen grapes to launch them into a happy orbit. An Eau staff member serving a tray frozen grapes to the children swimming. Families who do not book suites (all of which have pullout sofa beds) may find booking two adjoining rooms the most comfortable.Standard rooms come with one king-sized or two double beds. Some premium king rooms include sofa beds. Call the resort directly to confirm your bed configurations. There are club level rooms, too. Families will enjoy breakfast, afternoon snacks, and cocktails. Aquanuts is available for children ages 5-12 daily from 9AM to 4PM and a Kids Night Out on Friday and Saturdays from 6PM to 9PM. Half Day Sessions are $80 per child, and Full Day Sessions cost $108 per child. Kids Night Out is $80 per child, The hourly rate is $22 per child. Check rates or read our full review on the Eau. We experienced some of the best attentive service in all of our stays from the bell staff and doorman to the beach attendants. A truly five-star staff really helps parents enjoy their family vacations on a new level. My son left his hat and sunglasses in the backseat of our car, and the valet ran inside and chased us down to return them at the elevators to our room knowing we would need them. 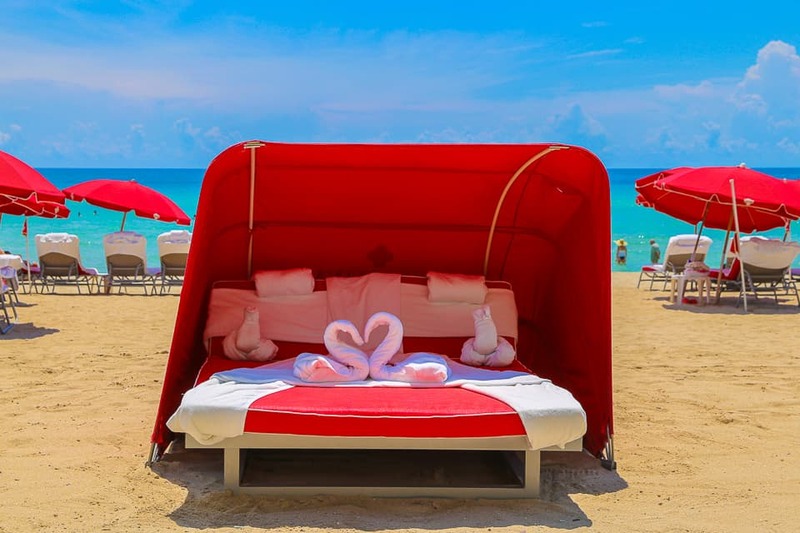 A couple’s beach lounger at Acqualina. When we got to the beach for the first time, my son was overwhelmed and delighted by the expansive stretch of high-rise condo buildings along the Miami beach as far as the eye could see. He sprinted off to explore. I was carrying a heavy beach bag and a fancy camera, and I asked the beach attendant to run and get my son. Off he sprinted. He challenged my son to a race back to me, all smiles, and having the time of his life. Fabulous balcony views at Acqualina. And sometimes a mom needs a little help. I had a self-tanner accident and sought the spa’s assistance, and they provided samples of every exfoliant in their product line. Acqualina defines the service one can expect from a truly great independent hotel. 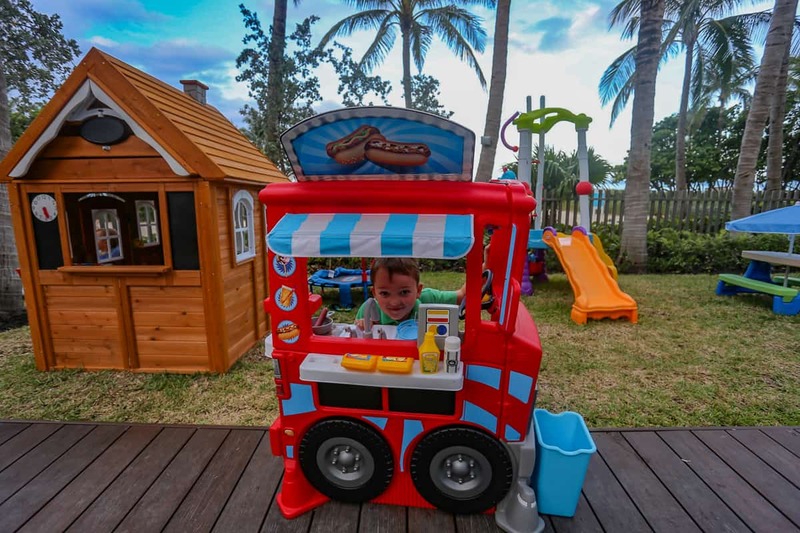 It’s miles away from the Miami beach scene and perfect for families. If the service wasn’t enough, its expansive suites are some of our favorites for the gorgeous interior design with muted metallics. An incredible breakfast reward after waking to photograph the sunrise. Families fit right into the pool and beach areas. 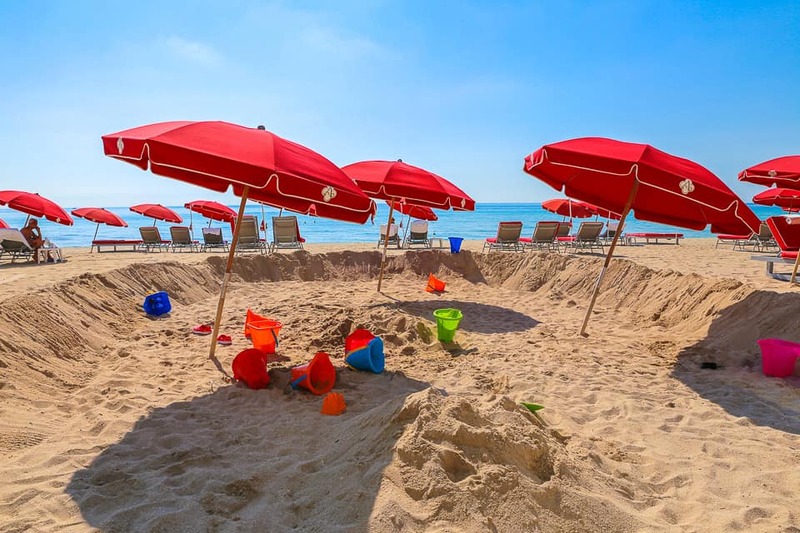 Staff provide a designated sand castle building area with extra umbrellas for shade. Children from all the Americas mingle at the kids’ club or at the small soccer area as they play pick-up games sporting their international jerseys with Emirates logos. No, my son didn’t play soccer with the bigger boys, but he was invited to join his new friends in a water balloon fight led by a willing, soaked dad. Adults seeking serenity will have no problem finding a quiet pool area, and if they seek exclusivity, the private spa pool is only open to guests receiving treatments that day. Making friends with another guest at the pool at Acqualina. Acqualina, in Sunny Isles just above North Miami Beach, is equidistant to the Fort Lauderdale and Miami airports. Families get a break at Acqualina in that entry-level rooms include a king bed and pull-out sofa and are spacious for families. For those seeking more beds, the deluxe one-bedroom suites have both a pull-out sofa and a twin daybed in a separate reading room. One-bedroom suites come with complete kitchens and stocked freezers with ice cream to take the mini bar to a cool, new level. Acquamarine is the kids’ club adjacent to the sports lawn. Children aged 5 to 12 can participate in sessions from 11AM to 3PM, with weekend hours from 10AM to 4PM. 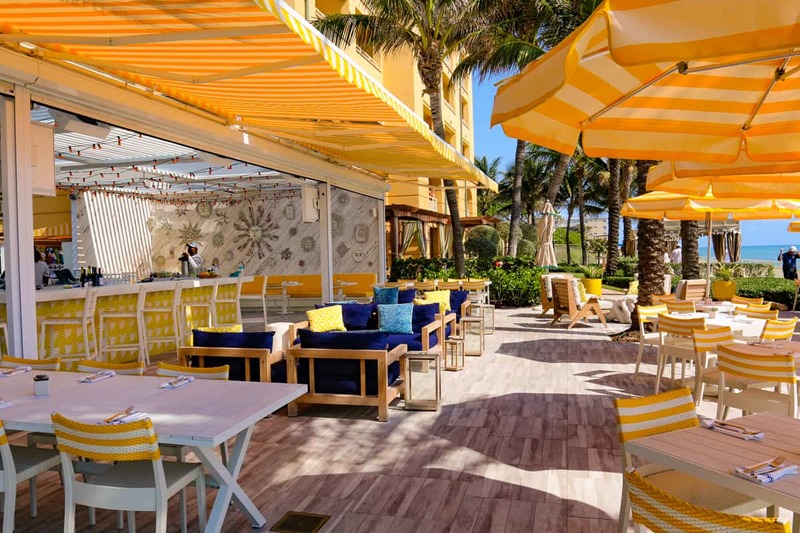 Check rates or read our full review of Acqualina. All rooms are ocean front with balconies at the St. Regis Bal Harbour. 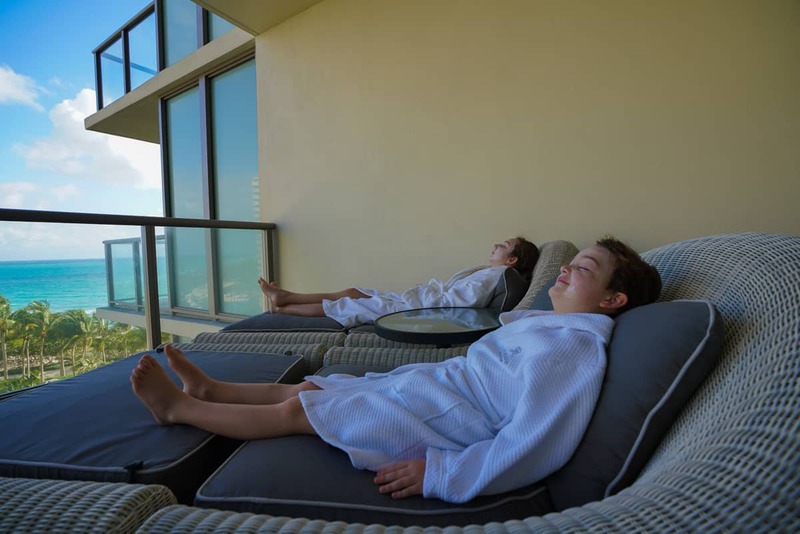 The St. Regis Bal Harbour offers an elegant family respite directly across the street from the legendary Bal Harbour shops and its restaurants. It’s ideal for both a beach and shopping break. 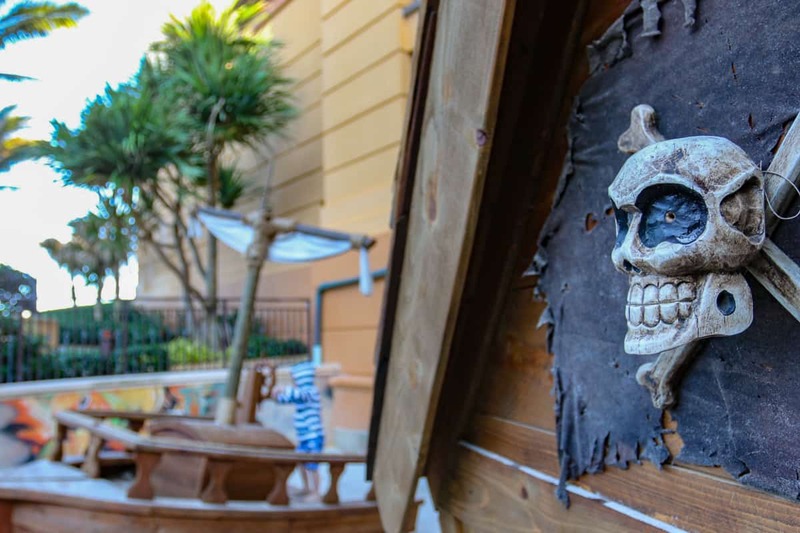 The family pool may be a little too straightforward and small to engage kids for long, but during peak season the resort runs craft activities at a nearby table. Pool service was incredibly slow at both of our visits, which is my only criticism of the hotel. For a formal resort, the St. Regis Bal Harbour has a surprising number of toy structures and ride on toys circulating. 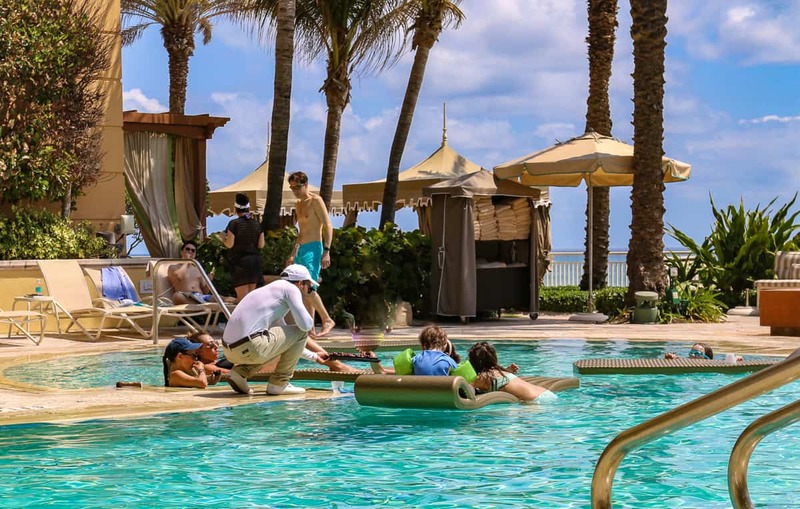 A steal for families, the SPG Kids all-inclusive resort plan is a no-brainer, charging $35 a day per child which includes three meals at the restaurants and unlimited smoothies by the pool. You break even after breakfast and lunch, so dinner is essentially free. The Greek restaurant Atlantikós serves an excellent breakfast buffet as well as a kids’ menu for dinner. The other option for families is the causal BH Burger Bar. Bal Harbour offers casual eateries, but not the pricing to match. I found it funny that my first visit to the hotel for a hamburger and hot dog lunch with my son cost about $85. 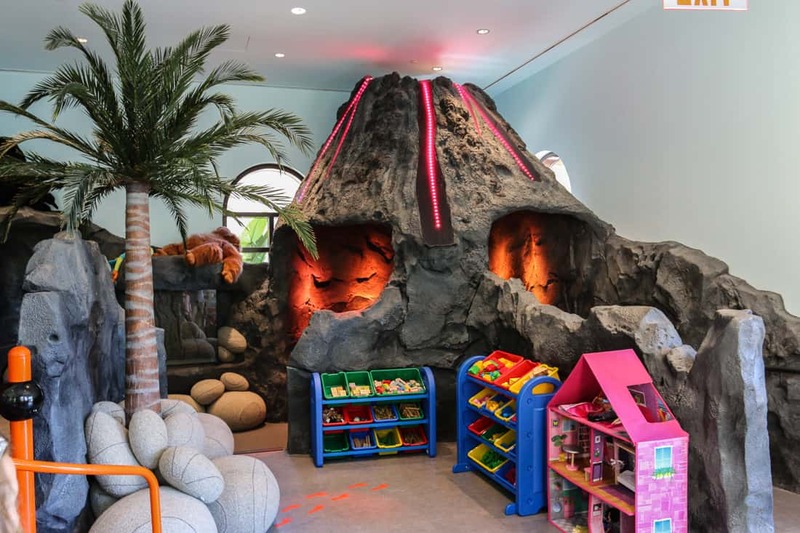 The St. Regis Bal Harbour kids’ club. There’s a small kids club that offers crafts and games to ensure parents can enjoy the Remède Spa. Children receive resort packs at check in that include sand toys for the beach and a voucher to enjoy the macarons at the lobby’s patisserie and tea salon, La Gourmandise. This lobby café offers an afternoon tea service. The main room of our Atlantic suite had a full kitchen and TV room with pullout sofa. 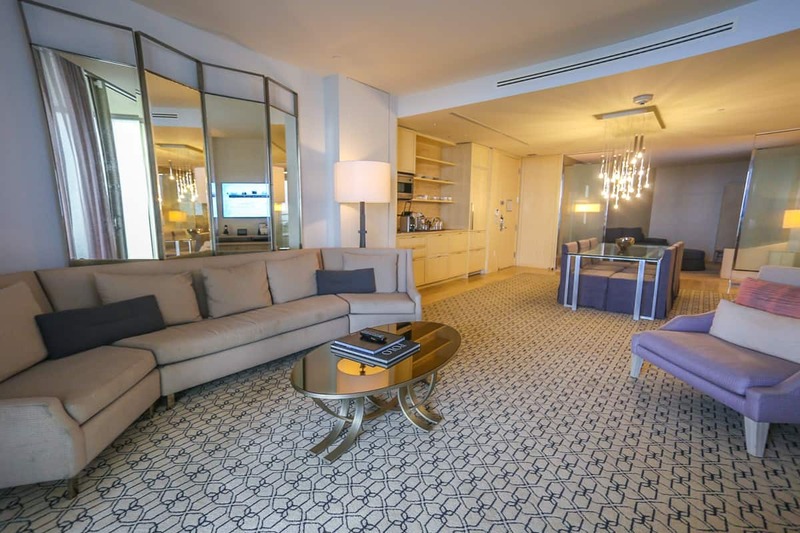 The standard rooms at the St. Regis Bal Harbour are incredibly impressive and spacious, offering entryways with large closets. Split baths with commode and walk-in closets are on one side of a long hallway and shower, tub, and double-vanity are on the other. There’s so much storage space that every Manhattanite will jump for joy. All rooms and suites have ocean views and private balconies with two large wicker chaise lounges if you feel ambitious enough to wake for a spectacular Florida sunrise. Some suites offer a dining area and kitchen and a slightly awkward pull out sofa in the TV area of an expensive open space. The real draw of our suite was the size of its bathroom. There was literally a marble hallway from the vanity to the bathtub with enough wall space to create a small gallery. We used points on one stay to upgrade to the giant Atlantic Suite, but I actually preferred our stay in a standard room more. It was plenty spacious. Finding our way in the hotel bathroom. This was just one wing of it. Families will find the double queen-bedded standard rooms spacious unless they choose to splurge for a suite. The room categories are also based on hotel floor for the improved view, though all suites have ocean views. Our Atlantic suite had a dining area and kitchen if that is convenient for families. The kids’ club operates every day from 9:30AM to 4PM and half and full day sessions are available at $55 and $90, respectively. 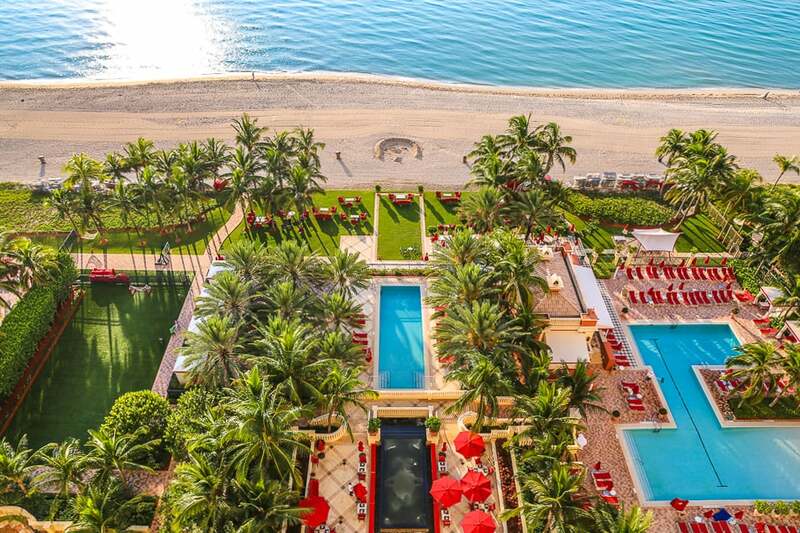 Check rates for the St. Regis Bal Harbour. The Four Seasons Orlando has several pool areas for everyone. The Four Seasons Orlando truly changed what a Disney vacation could be when it opened. It’s the only Mobil 5-star resort in Central Florida. But don’t think that this resort is suited only for Disney-bound families, as my husband even suggested while we enjoyed time at the adult pool that we return for our anniversary. It manages to be all things for all guests. 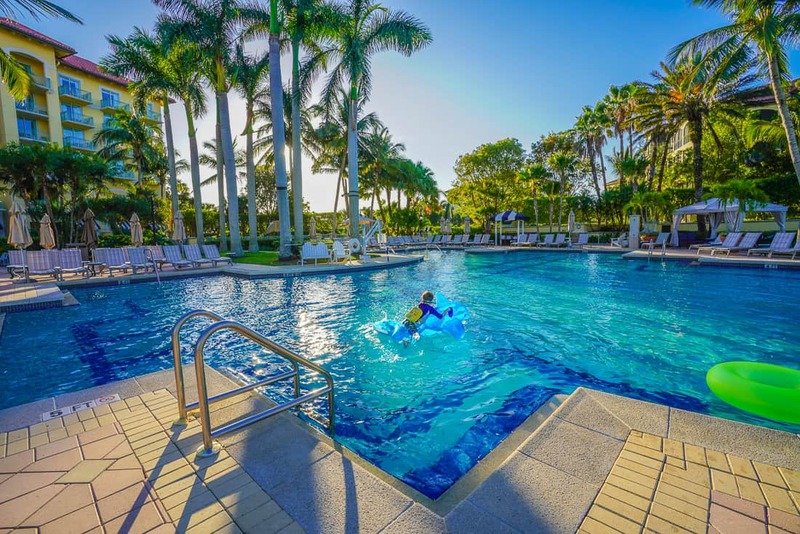 The strength of the Four Seasons is its exceptionally clever resort design, the rooms, and the expansive pool area which is one of our favorites in the Sunshine State. The Four Seasons pool areas total five acres. The resort is surprisingly compact, and doesn’t feel overwhelming to explore or navigate, yet the pool area covers several acres. 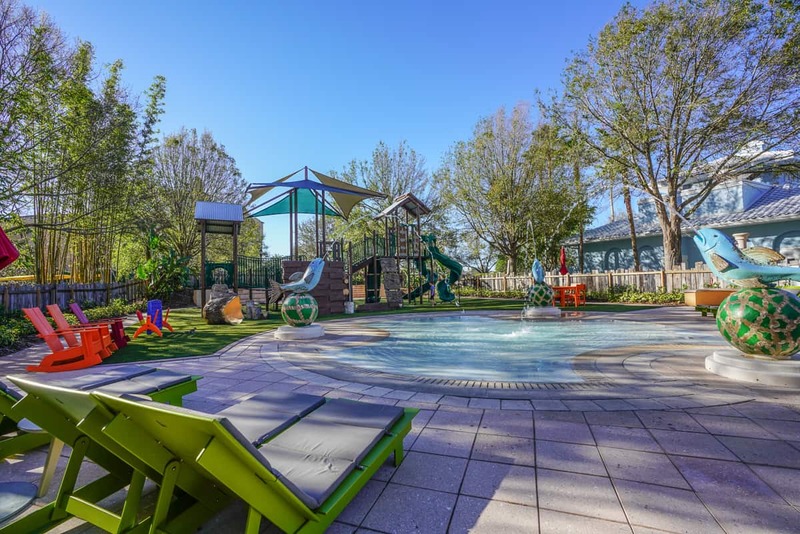 The family pool, lazy river, waterslides, and splash areas are well-designed to offer little nooks and alcoves around them so that it can still feel private. The pool area remains secluded and serene even with several guests using the facilities at the same time. Your kids will ask to stay at the pools and skip the Disney parks like ours do. The exceptional kids’ club is complimentary to allow parents time at the adult pool where eye contact call a pool server to your chaise lounge instantly. 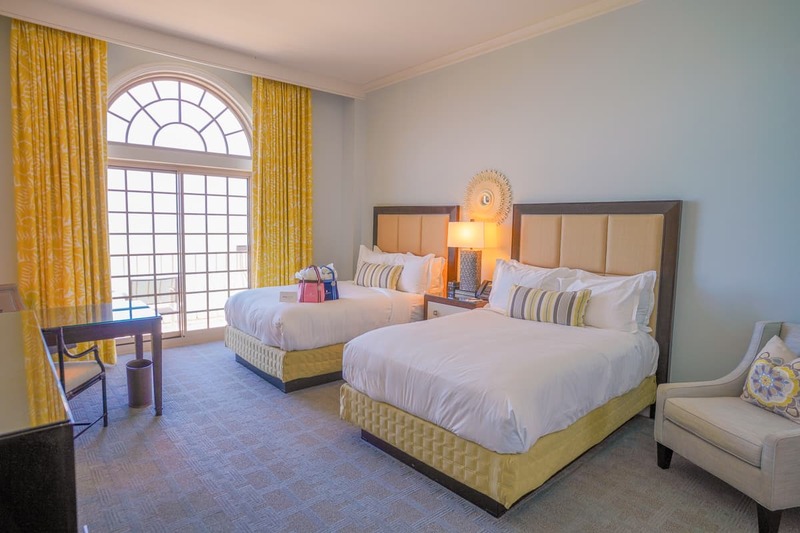 Four Seasons Orlando guests visiting Disney receive two key Disney resort benefits. The first is being eligible for Extra Magic Hours when parks are open early or later by an hour exclusively for Disney resort guests. The second, and most important, is Four Seasons guests can now book ride reservations using the Fast Pass system sixty days prior to check in, just like Disney resort guests. 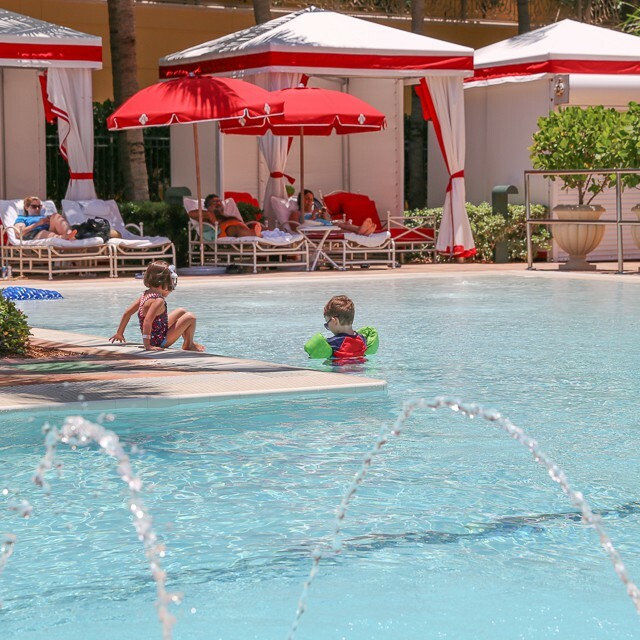 The Kids Four All Seasons club is complimentary and for children ages 4 to 12. The resort offers scheduled bus service to all four parks that are rarely full because most guests are savvy enough to take an Uber to save time. The resort boutiques also offer some of the best and most stylish Disney merchandise for adults. Think exclusive Missoni Mickey ears or espadrilles. And the children’s retail selection is just as stylish. The restaurants are strong, including the best character meal in all of Disney World a few mornings per week and the rooftop tapas and steakhouse called Capa. Our favorite is the excellent poolside restaurant PB&G serving fresh and inventive casual lunches. An incredible perk is securing a park-view room from which all four Disney parks and their fireworks shows are in view in the distance. The sun sets in front of your room, and the stress of the crowds melts away as you’re in the happiest place on earth. When we stay at the Four Seasons, we enjoy the parks on the weekends, since there are always crowds, and we enjoy the resort during the week when the pools become really private. Standard rooms include a king-sized bed and comfortable queen-sized sleeper sofa. Rooms with two double beds are available to connect a king bedded room for families with more than two children. Park-view rooms are worth the price increase, as balcony views of sunsets and all four theme park fireworks deliver a perfect ending to a busy day. Princess and pirate swag await kids at check in. 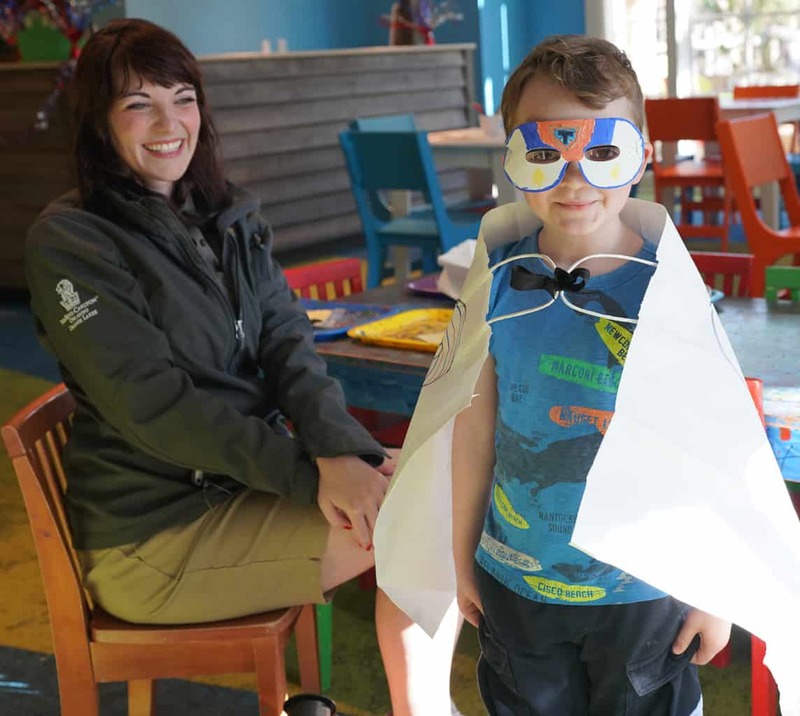 For ages 4 to 12, a complimentary kids’ club runs daily from 10AM to 6PM. 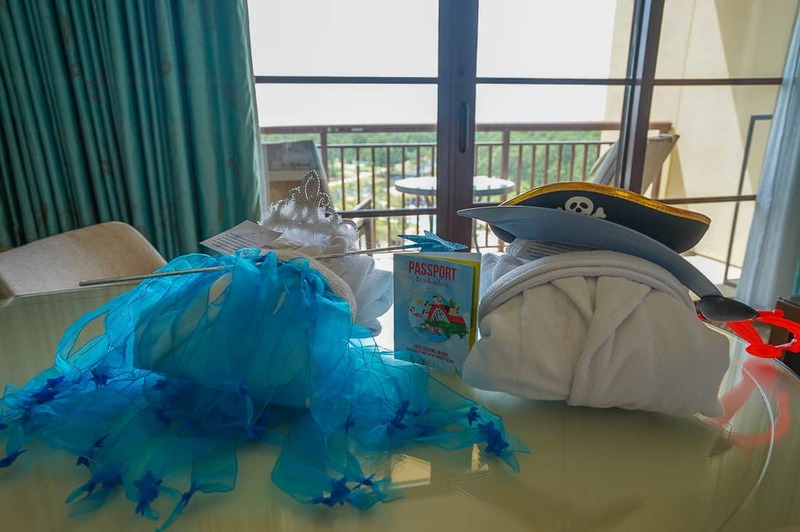 When notified in advance of the children’s arrival the hotel will leave pirate or princess swag for the children in the room at check in. 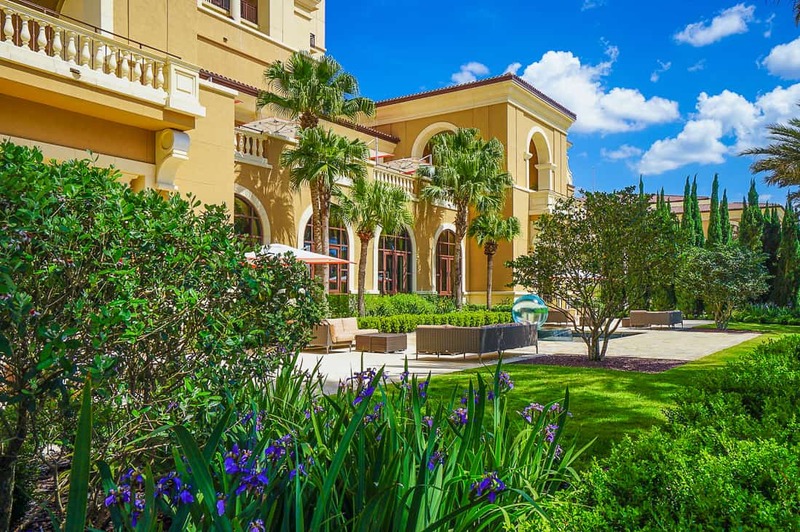 Check rates, or read our full review on the Four Seasons Orlando. The enclosed playground and splash pad at the Ritz Carlton Orlando. 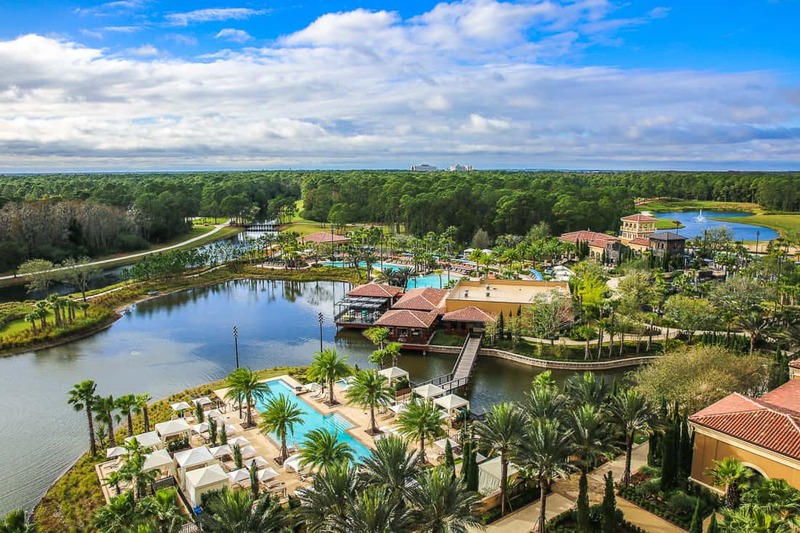 Grande Lakes is a vast property for both the Ritz Carlton Orlando and the JW Marriott. They are closer to International Drive and Universal’s theme parks then they are to Disney World. The Ritz Carlton actually takes pride in the fact that its the only luxury resort in Orlando that has no visible sign of Disney World anywhere in its lobby. This giant resort complex shares meeting space and a massive spa complex with the JW Marriott next door. Grande Lakes has always been the local favorite for staycations and exceptional family programming around the holidays like Christmas parties and gingerbread making classes, New Year’s Eve family parties, Easter egg hunts, and the Fourth of July fireworks. 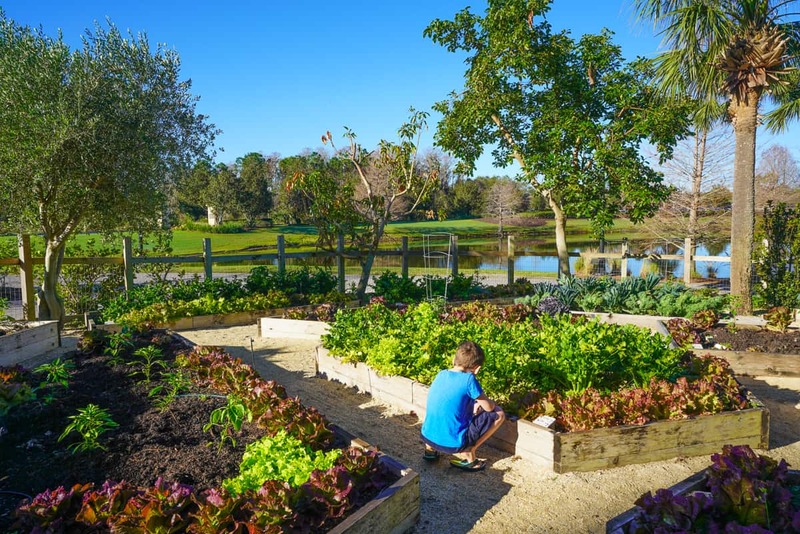 Grande Lakes boasts two massive gardens to produce as much for the resort’s kitchens as possible. This Florida resort is in process of an update and has revealed a new lobby, while rooms are still in process. The club lounge offers the best club experience in all of Orlando with excellent food and attentive service. Parents appreciate the separate section in the club for children with kids’ food, candy, cookies, and games. They enjoy the free-flowing champagne, wine, and beer while enjoying views of the resort grounds and Disney fireworks in the far distance. A strength of the Ritz Carlton Orlando is its food and beverage program. All of the restaurants on site are outstanding, many of the ingredients locally grown on the resort’s farms. Farm-to-table cuisine is taken very seriously at Grande Lakes. There is no separate adult pool, but guests of the resort spa enjoy access to a private spa pool which has few crowds and a delicious spot café for before,—or after—a treatment or work out. 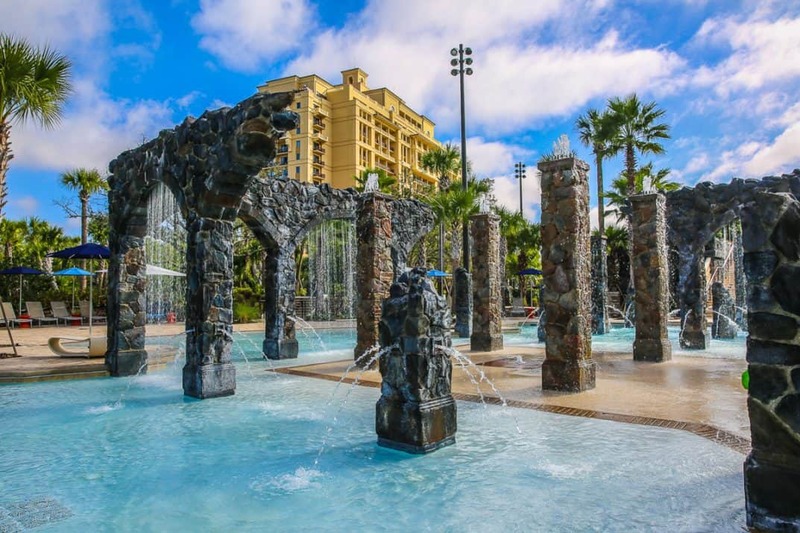 Guests who seek more active outdoor pools will enjoy the lazy river and games hosted at the next-door JW Marriott; parents of younger children will love the enclosed splash pad and playground near the Ritz Kids Klub. Ritz guests receive two complimentary hours included in the resort fee. Superhero Day at Ritz Kids. 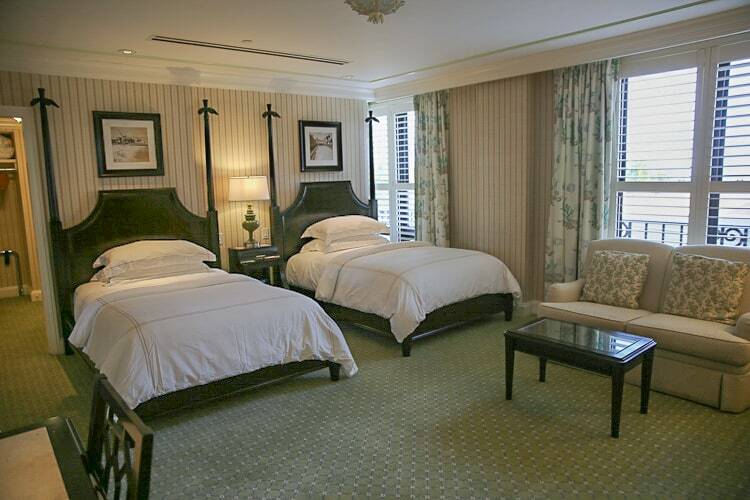 Families of four who do not reserve a suite or adjoining rooms will receive rooms with two queen-sized beds. Families with one child can book a king room and request one rollaway. Club-level rooms have access to generous spreads that could replace all breakfasts, some lunches, and even some dinners. The Club Lounge is on the top floor with far-off fireworks views and a dedicated kids’ section. For ages 4 to 12, from Noon to 5PM daily. Club Level and Executive Suite guests receive complimentary time for up to three children per room, per day. All other guests receive two complimentary hours for up to two children per room, per day; additional time at $20 per hour, per child. Open house daily for all children with parents between 10:30AM and 11:30AM for craft activities. 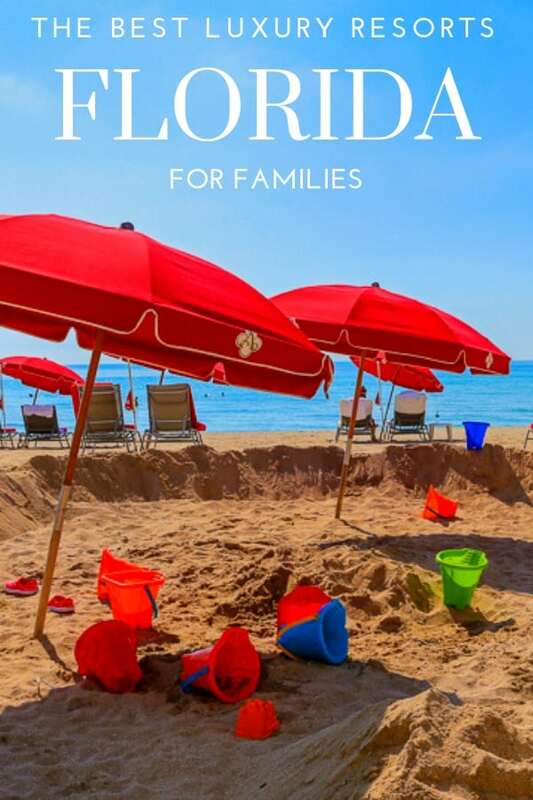 Can I help you plan a Florida vacation? 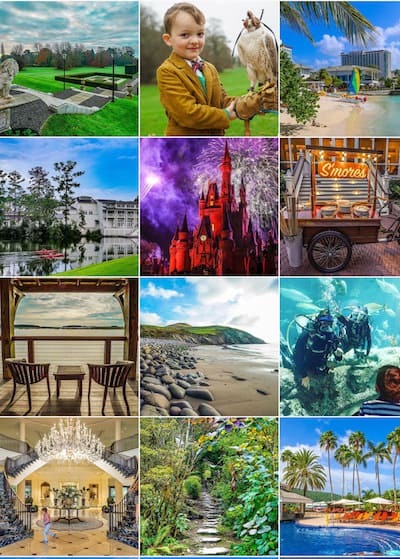 I offer vacation planning services from a detailed Disney World plan to a multi-city Florida adventure. So many amazing choices for families! I admit that I’m partial to the Breakers. Love the historic property and those special luxe touches. I don’t know if I’d ever leave!